After the news last week that Marvel and the Jack Kirby estate had settled their decades-long legal dispute, the story has shifted to a DC/Kirby property. Yesterday, famed artist Robert Liefeld tweeted an interesting tidbit about that DC/Kirby property in the wake of a story that DC Comics bigwig Dan Didio once told artist Paul Pope that he would rather have a Scooby Doo book rather than a new Kamandi book. Liefeld went on to note that Didio refused partly because Kamandi comic was “co-opted by Entertainment division” and was untouchable, suggesting that Kamandi was being fast-tracked for a movie or TV project. 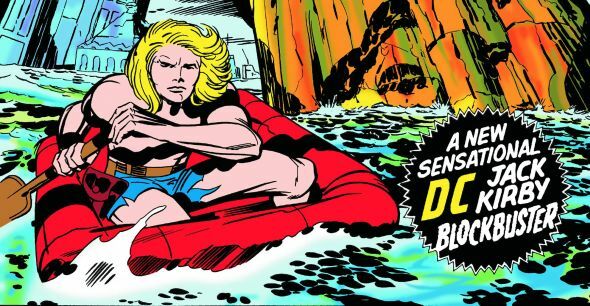 Kamandi is a young hero in a post-apocalyptic future that happened after an event called “The Great Disaster” that reduced humans to savagery in a world led by intelligent, highly evolved animals. Kamandi is a Jack Kirby creation and published by DC Comics after DC editor Carmen Infantino had tried to acquire a license to publish a Planet of the Apes comic. He instead described the film to Kirby who roughed out his Kamandi story from a strip he created in 1956, titled Kamandi of the Caves. Most of the character’s appearances occurred in the comic series Kamandi: The Last Boy on Earth which ran from 1972 to 1978. An animated Kamandi TV series was optioned in the ’70s, but was cancelled before entering the production phase. Kamandi and his supporting cast made four appearances in the animated series Batman: The Brave and the Bold only a few years ago. At the least, if the character isn’t coming to a big or small screen, there is a strong suggestion that Kamandi is coming back to print after Quantum & Woody artist Tom Fowler tweeted that he had to turn down work on the book yesterday. Just had to turn down a KAMANDI book this morning and now I feel sick and alone and universe makes no sense and cry. Liefeld also said that he felt that Kamandi was some of his favorite work from Kirby, calling it his best work in fact. Others agree and believe that Kamandi’s inclusion in the New 52 may signal just an expansion of the Multiversity established by Grant Morrison. No official word from anyone with DC Comics yet about a Kamandi book.